I know, right? It's so cliche. Two young women look to spice up their summer and take their minds off things like sour breakups by going deep sea diving in the middle of the ocean, hoping to catch a glance at some of the beautiful sharks they keep hearing about out there. I'll never understand why people would intentionally put themselves in the middle of danger, and talk about it like it's supposed to be a once-in-a-lifetime opportunity. Yeah, it's a once-in-a-lifetime opportunity because you'll likely never get another opportunity to do anything else again, including swimming, walking, or even breathing. So yeah, fun time. But this summer needed a shark thriller. It's become the American way. We spend all year talking about our big plans for the summer, which for many of us includes some kind of beach activity, so Hollywood naturally must combat that with its best don't-go-near-the-water movies. And we fall for it every single time. 47 METERS DOWN is no exception. Starring Claire Holt and Mandy Moore (aka my new favorite actress after completely slaying expectations in the NBC drama, This is Us), the film is every bit as basic as most Jaws knockoffs, but it's consistently engaging even though you know just about everything that's going to happen in every single scene. The dichotomy between Holt as Kate, the more adventurous friend to Moore's more cautious Kate is just one reason why the film works. Though both characters could have been fleshed out more (I personally could have used some explanation as to why Lisa's ex would call her boring, right before he dumped her. But I guess we needed more affirmation that becoming shark bait wouldn't ever be a thing that for which Lisa would normally volunteer herself), we spend enough time with them to understand the strength of their friendship, its complexity, and how being in a life-or-death situation could really put that to the test. But of course, the larger piece is the horror story. Lisa and Kate being locked inside a rickety cage and dropped into the ocean with the innocent intention of gawking at seawater creatures. You know nothing good can come from that, but you watch as they struggle to try to save their own lives, and taunt us with the notorious "I'll be right back" line when all their naive dreams end up in bloody tatters. Thankfully director and co-writer Johannes Roberts (The Other Side of the Door) at least doesn't subject his woman protagonists to skimpy bathing suits and flighty one-liners. Instead he delivers a thriller with atmospheric cinematography that places the viewer into the cage with Lisa and Kate, and into the dark, endless ocean that swallows them hole. We root for them, especially Lisa, for whom it becomes increasingly clear that this is a moment that she's determined to survive, to prove something to herself. But unlike Blake Lively's character in The Shallows, Lisa's motivation is a frivolous, underdeveloped breakup narrative, while the former carries far more urgency. 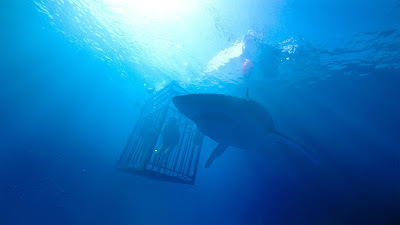 But 47 METERS DOWN is a cheap summer thriller with a bite, B-movie fare that's heavy on empty calories but engrossing enough to consume as a one-time only guilty pleasure. You'll likely not come back for seconds. 47 METERS DOWN is in theaters Friday.